How was your Senate voting experience? Did you feel like you had more control over how you voted? Was it confusing? 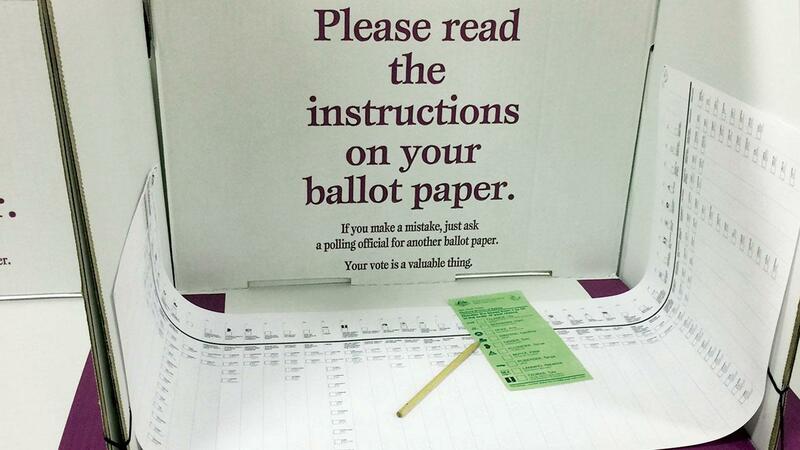 We’ve received some comments from CEFA supporters who said they were not told how to vote on the Senate ballot paper and others who say they were given misleading instructions. Some people who have always voted below the line stated that they preferred the new method as they didn’t have to spend 20 minutes numbering all the boxes below the line. Others were happy that their vote was able to exhaust if their preferred candidates did not get elected. While some who did allow their vote to exhaust are now stating that perhaps if they did preference further it may have prevented some of the crossbench (that they are unhappy with) being elected. One Tasmanian result that seems to reflect the will of the people is the re-election of Lisa Singh from the ALP. She had been relegated by the party to the sixth spot on the ticket, but gained enough below the line preferences to get ahead of the ALP’s fifth candidate and win a seat in this Parliament. This means that the Tasmanian people were able to choose which Senator they preferred over what the party had wanted. In the end, the Coalition won 30 seats (a loss of three), the ALP won 26 seats (a gain of one), the Greens won nine seats (a loss of one), Xenophon won three seats (a gain of two), One Nation won four seats, Bob Day, David Leyonhjelm and Jacqui Lambie are back and we have the new Senator Derryn Hinch. The last Senate with eight crossbenchers was at one point described as feral. This new crossbench has 11 Senators. Of course, some people are happy that we have a bigger crossbench. 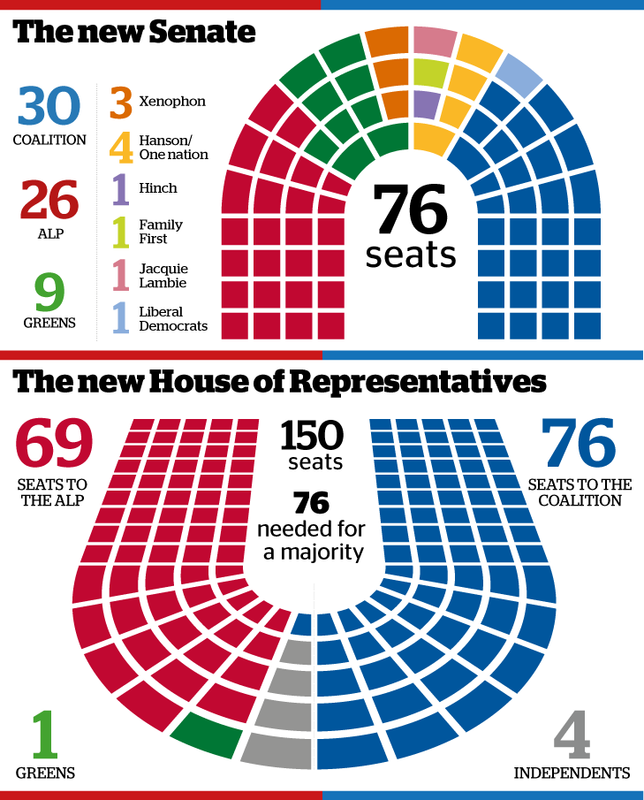 It’s been reported that this is the biggest crossbench ever and that the Senate voting reform created this. But is this right? The Senate reform may have made a difference to the makeup of the Senate. But the real difference of this election was that it was a double dissolution and this meant that each elected Senator only required about half the number of votes than at a normal election. You might have forgotten why we even had a double dissolution (we didn’t hear much about it in the election campaign). But the reason was that we had a disagreement between the two House of the 44th Parliament. The Houses were deadlocked. The House of Representatives had three pieces of legislation they wanted made into law that the Senate would not pass them. Thus by using the provisions in Section 57 of the Constitution, the Prime Minister asked the Governor-General to dissolve the whole Parliament. The whole of this complex and elaborate machinery for the settlements of deadlocks is founded on the assumption that two Representative Chambers, directly elected by the same class of people in all the States, will not work in harmony, but may at times come into deadly conflict….The provision made by this Constitution for the dissolution of the Senate is the latest and greatest experiment in Federal Government. No other second Chamber in any federal system is liable to be dissolved on any question of general legislation…. If an uncompromising attitude on the part of both Houses leads to a double dissolution, the Senate may be reconstituted with added, and not diminished, authority. On the other hand, it is equally possible that the Senate, badly led, may be badly beaten in the appeal to the people and to the States. This much is certain, that the people as final arbiters will be the gainers of power by the liability of both Houses to dissolution. Has the Senate been badly beaten by this double dissolution election? With the largest crossbench ever, have the voters as the final arbiters made a judgement about the legislation or the Parliament? Some people disparage our Constitution, but it’s interesting to note that Quick and Garran called this provision of the Constitution the latest and greatest experiment in Federal Government. In 1901, no other country had a way to break deadlocks between the Houses like this. The US for example, still has no way to break deadlocks, which occasionally causes the shutdowns of Government services. Do you think the double dissolution worked? You might be pleased that one of the side effects of the double dissolution is that we have a bigger crossbench, or you might be unhappy. But this was not the purpose of the double dissolution. The purpose is to break the deadlock. If the Government decides to press on with the three deadlocked Bills that the Senate would not pass in the last Parliament, they first must attempt to pass the Bills in the normal fashion, one House at a time. If the Senate will still not pass these Bills the Prime Minister can request that the Governor-General convene a joint sitting of the Parliament. To pass the joint sitting the Bills must be agreed to by an absolute majority. This means more than 50% of all members of the House and the Senate, not just members present during the vote. The magic number in this case is 114. So the first step is that the Government passes the Bills through the House again and sends them to the Senate. The Government has 30 Senate votes and needs an extra 9 votes for the legislation to pass the Senate in this way. Labor, the Greens and Jacqui Lambie were opposed to the legislation in the last Parliament. Bob Day and David Leyonhjelm supported the legislation in the last time and are likely to support it again. So to get these Bills through the Coalition will need to support of all three Xenophon party Senators and all four One Nation Senators. Or at least six of these seven, plus Derryn Hinch. We’ll have to wait and see. If the legislation is not passed by the Senate and we go to a joint sitting, the Government will need support from crossbenchers in both the House and the Senate. On top of the previously mentioned parties and people opposed to the legislation in the last Parliament are MP’s Bob Katter and Andrew Wilkie. Cathy McGowan for Indi supported the legislation in the 44th Parliament. So to pass the joint sitting the government will need to support of Bob Day, David Leyonhjelm and Cathy McGowan, PLUS either One Nation OR the Xenophon team, PLUS the support of Derryn Hinch (this assumes that One Nation stays together as a voting block). There are a few other Constitutional process that will occur in the coming weeks. These include the splitting of the new Senate into long and short terms according the Section 13. It’s possible we’ll also see the use of the processes outlines in both Section 44 and Section 15 as there is concern that one Senator in WA may be disqualified from Parliament. We’ll conduct some further research and keep you posted.